NB-IOT and LORA are two popular technologies that can be used for IOT device connectivity. They have important similarities and differences. This article’s aim is to explain the basic concepts behind both technologies and help you understand the fundamental differences and trade-offs. After reading this, you should be able to take an informed decision to choosing the correct path. LORA and NB-IOT are ideal technologies for low-power internet of things applications that can be developed at low cost. Some examples are: localisation and tracking of vehicles, measuring water levels at remote sites, measuring air quality, … The main idea is that your device should not be connected continuously, but only communicate “now and then”. A range of up to 15 kilometers can be achieved around a LoRa gateway, NB-IOT covers every location where there is mobile coverage since it uses a specific part of the spectrum in the cellular network. LoRa is an abbreviation for Long Range. It enables connecting a lot of devices or so-called “things” without the need to use 3G or WiFi. It is a Low Power Wide Area Network (LPWAN) standard. This term combines three parts: Low power, Wide area and Network. Let’s consider Network first. The difference between a normal device and an IOT device is it’s capability to connect to the internet. 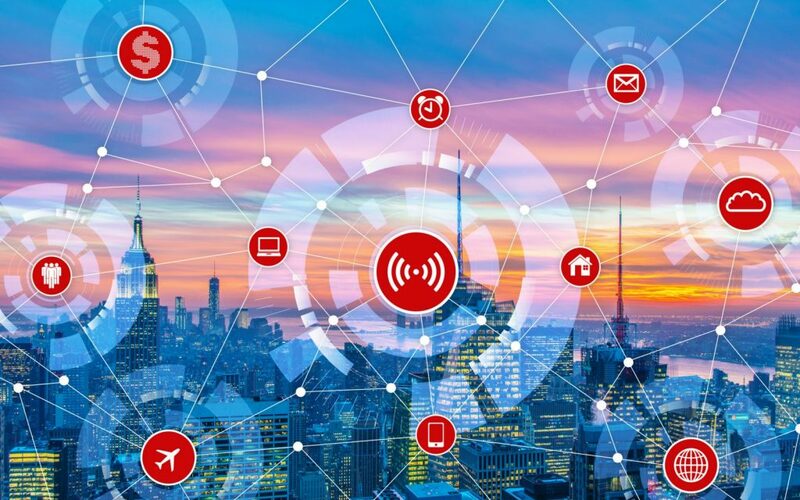 Since it is expected to have millions of IOT devices, a network is needed to connect all of them. This network must be based on standards because the IOT devices and the network are developed by different companies. How about Wide Area (WAN)? LAN (local area network) is a familiar term. Typically, these networks are relatively local and have a limited range around the access points (e.g. your wireless router at home). Wide area networks on the other hand need to bridge much larger distances. This is necessary for IOT devices because they should be usable everywhere. Think of this as an AM radio station, frequently used in the past. It is possible to receive AM radio even in the middle of nowhere, far away from the transmitting station. However, these stations are using kilowatts of transmission power. So it seems to be easy to bridge long distances using high power. How to make it Low power? The battery life of IOT devices should be optimized. Here is where the dilemma is clearly visible: kilometers of reach are needed for communication, but power consumption should be as low as possible. Physical laws dictate that if a transmission has to be sent over long distance, one can either increase the transmission power or decrease the bandwidth of the communication channel. However, the smaller the bandwidth, the lower the capacity of the channel. A clear example of this is the use of Morse code for transmission. In the old days, a good operator was able to transmit 2 characters per second. This is about 20 bits per second. Today, in a wireless network, millions of characters per second can be transferred. The picture below makes a clear comparison between technologies in terms of bandwith and range. In the upper left corner, the typical WiFi standards (802.11) are depicted. They achieve high bandwith over relatively small range and require a lot of power. The cellular technologies 2G-5G have extended range, but these also require high power. Bluetooth, BLE, RFID, NFC, … need much less power than the previously mentioned technologies, but they also have low bandwidth and short range. LPWAN (Low power wide area network) seems the solution to go to (very) long range communication with low power, at the cost of low bandwidth. LoRa is such an LPWAN standard (Sigfox is another example of an LPWAN, but not discussed here). 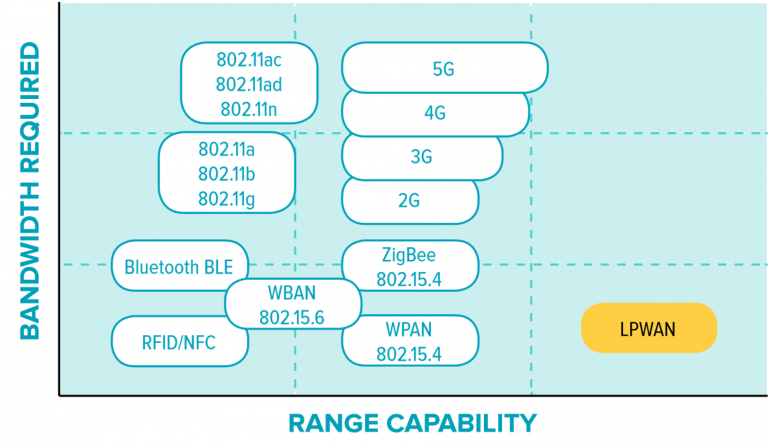 LPWAN versus other wireless communication standards. Source: Leverege. When should LoRa be used? This picture above should make it very clear that LoRa is not at all comparable with WiFi and not at all a replacement of WiFi. It is much closer to the mobile internet standards, where low power variants are also in development. LoRa has it’s place in sensor networks where these sensors are not transmitting a lot of data. Examples are measurements of soil humidity, water levels or parking place availability. These will not change every second, hence the need for high data rate communication is alleviated. LoRa can be an interesting technology to connect these sensors to the internet. LoRa uses the unlicensed spectrum, such as the 868MHz (Europe) and 915MHz (US) bands. These are free bands which don’t require a license or fee to be paid for it’s usage. This does come however with a drawback: the allowed power is only 25mW in Europe and a little more in the US. Moreover, there are no controlled restrictions in an unlicensed band so there is always the question if some devices will jam the channel forever. The rated capacity of LoRa ranges from 250 bits per second to 50 kilobits per second. Unfortunately, this is not the whole truth. The law only permits the devices to have a duty cycle of 1% in these unlicensed LoRa bands. Therefore, the 250 bits per second have to be divided by a factor of 100 yielding 2.5 bits per second. Remember the Morse code data rate? 20 bits per second. This means that this is a factor of 10 slower than Morse code. LoRa is the technology itself (the so-called physical layer implementation). LoRaWAN defines the communication protocol for the network between the IOT devices and the end-user, while the LoRa physical layer enables the long range communication. LoRaWAN consists of the IOT devices, distributed gateways and an infrastructure which is capable to transmit the IOT messages to custom applications. This is depicted in the figure below. 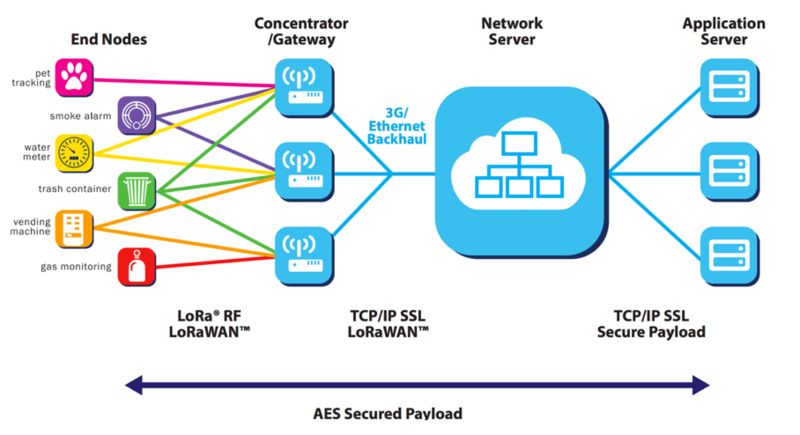 LoRaWAN architecture. Source: LoRaWAN alliance. With LoRaWAN we see two approaches: the commercial and the communitiy approach. In many countries, telecom operators started to deploy LoRa networks. They are physically placing LoRa gateways all over the country to achieve decent coverage. As with cellular phones, you can buy a contract and use this infrastructure. The community approach is led by The Things Network (TTN). They have built a network to transfer the messages between the gateways and your application. For that, they need gateways all over the world. A growing user community is placing gateways that can be used by TTN on a voluntary base. The drawback here is that there might be no coverage for your IOT devices in the intended location. A map lets you check the availability in your area. Narrow-band IOT or NB-IOT is a communication standard, designed to let IOT devices communicate via carrier networks. 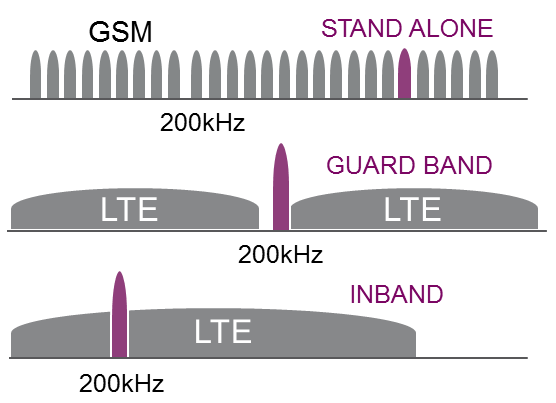 This is achieved either within an existing GSM carrier wave, in an unused guard band between LTE channels or independently as depicted below. NB-IOT can support huge numbers of devices over just 200kHz of spectrum. This attracted telecom operators who want to offer a mobile IOT carrier service. The major difference with LoRa is the fact that NB-IOT is incorporated in existing cellular networks, with a software change on existing hardware (= software defined radios on existing GSM antennas). Whereas for LoRa, extra gateways (=extra hardware) has to be placed by the operators. The key here is again that this technology is aimed at constrained devices. This means that the IOT devices have serious limitations imposed upon them in processing power, network connectivity and/or battery life. The same examples are true again: humidity monitoring, water level monitoring, parking space availability, … These IOT implementations don’t have a demand for high bandwidth or low latency. NB-IOT can be a very interesting way to address this kind of implementations. When should NB-IOT be used? From an end-user perspective, NB-IOT based systems are designed to make IOT deployments possible in situations where it is impractical or impossible to deploy a dedicated unlicensed network. Any area with mobile coverage is now potential fertile ground for NB-IOT. However, despite the fact that the 3GPP standard was finalized in 2016, it is not yet in widespread deployment. Moreover, the fact that NB-IOT is in the licensed spectrum should give a user a more secure feel about the implementation and a guaranteed quality of service. Next to this, the limited data rate should be taken into account. An interesting application could be monitoring the water level in a remote water tank. This would only require a few bytes a day. NB-IOT is a good choice in this case. No gateways need to be placed in this remote area, if there is mobile coverage, NB-IOT can be used. Moreover, NB-IOT has deep penetration in buildings and under ground. Technically speaking this is +20dB compared to GPRS. This enables interesting indoor applications. Above all, the power that is needed is extremely low compared to WiFi or GSM modules. This can enable devices to run on 1 battery for up to 10 years. LTE-M is very similar to NB-IOT and sometimes used as a similar term. However, LTE-M is optimized for higher bandwidth hence the data throughput in LTE-M is higher than NB-IOT (384 kbit per second versus <100 kbit per second for NB-IOT). LTE-M is optimized for mobile connections including voice. Power consumption is higher in LTE-M compared to NB-IOT. The roll-out of NB-IOT started in Europe, whereas LTE-M started rolling out in the US. This might be a factor in determining whether NB-IOT or LTE-M should be used. Which technology do I need? How remote is your application. Is there already LoRa coverage in the intended area? Do you need to work with the cellular network? Data rate. How much data do you really need to send? Most of the times, an IOT device will allow low data rate, maybe just a few bytes per day. Energy consumption. This will be closely related to data rate as well. How often do you want to wake your IOT device? Do you run on a simple battery, or is a mains supply available? Cost of operation. Do you want to pay a telecom operator for a stable licensed service? Or can you take the risk to go for the free unlicensed spectrum? Are you inspired to start the development of an IOT device? Do not hesitate to contact the Sentineo team to help investigate your specific use case.